Some time in the late-1990s, I cut this recipe out of a newspaper. The writer was definitely Andy Harris, the paper was possibly The Independent. I went through a phase of making it loads then, I don’t know, it just seemed to get forgotten. I’ve no idea why, as it’s great. 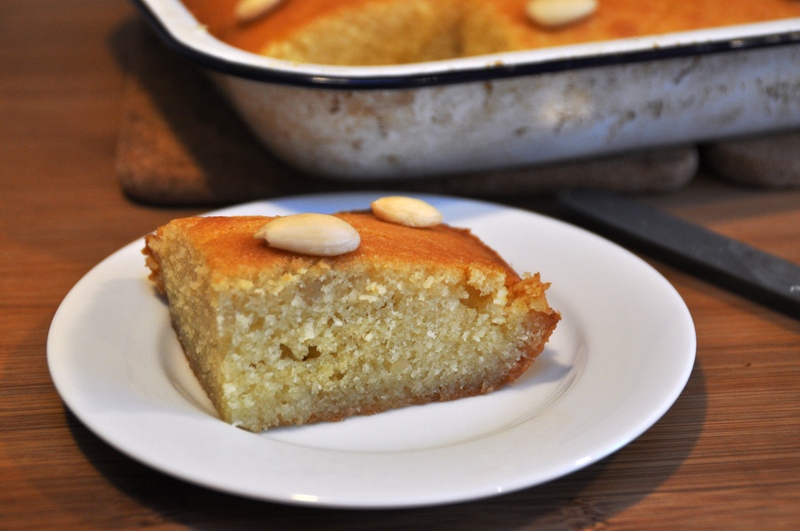 Just my sort of thing – quite dense and textured thanks to its use of almonds and semolina and moist thanks to a flavoursome syrup poured over after baking. 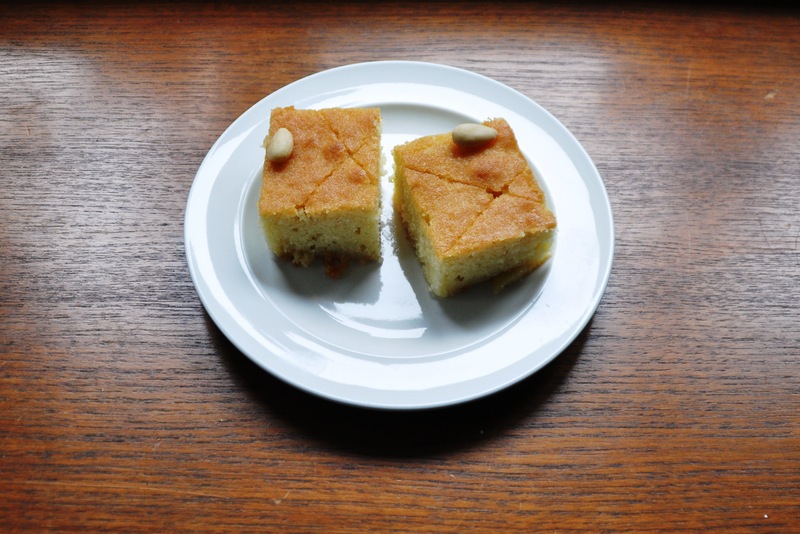 The name Harris used was revani, and he wrote about it as a Greek cake. Actually it’s a common through much of the Eastern Mediterranean, Levant, Maghreb and Middle East and is also known by the alternative spelling ravani, and by other names such as basbousa, hareesa/harisa, namoura and kalbelouz. Some versions appear to feature coconut. I don’t fancy this as syrup is spiced up with cinnamon, cloves and orange and in tandem with the flavour of almonds, I think the coconut would be a bit much. I’ve added a little orange blossom water to the original recipe. In part to boost that orangey-ness, but also as I find it’s the sort of ingredient that gets pushed to back of the cupboard and forgotten until it’s a decade over its best-before date. So I want to keep using it. Harris’s recipe featured brandy, but I don’t have any, I’m not sure what it would add, and I’m pretty certain that when this cake it made in Muslim nations it wouldn’t contain any booze. Fitting in with my interest in feast day foods too, it may also eaten by Coptic Christians in Egypt and beyond for their Great Lent and Christmas celebrations. Though this info seems to be lurking on Wikipedia, unverified, and repeated elsewhere by lazy bloggers. Oh, oops. I’m struggling to confirm it, and don’t know any Copts. 1. To make the syrup, dissolve the 350g sugar in the 700g water in saucepan over a low heat. 2. 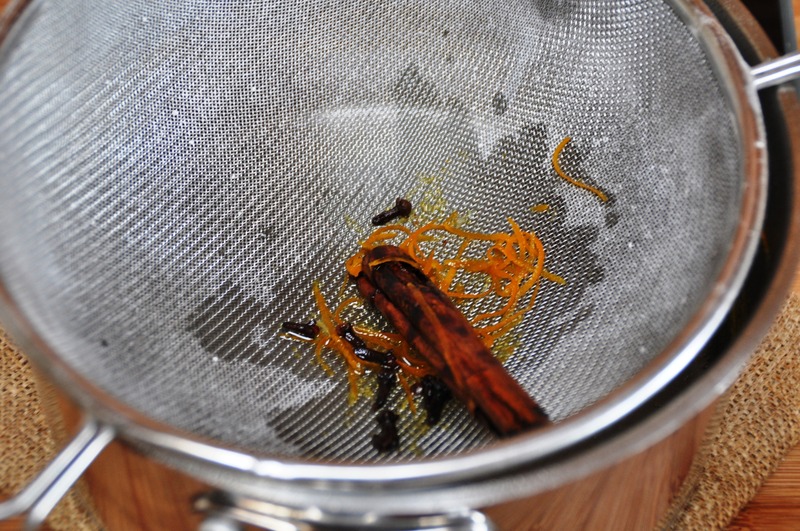 Add the cinnamon stick, cloves and orange zest and juice and simmer for 15 minutes. 3. Take the syrup off the heat and allow to cool. 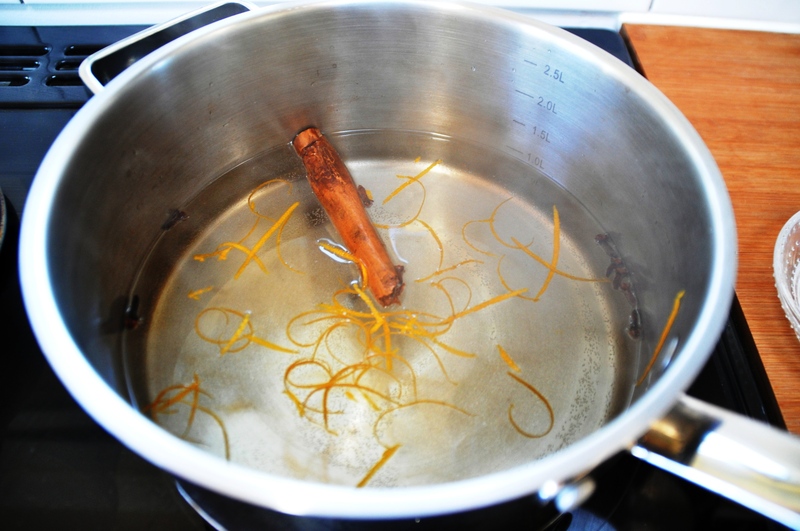 Stir in the orange blossom water, if using. 4. In a large bowl, or with a food mixer, beat the butter and sugar together until creamy and light. 5. Beat the eggs with the vanilla and almond essences, then gradually add the egg to the creamed mixture, incorporating well. 6. 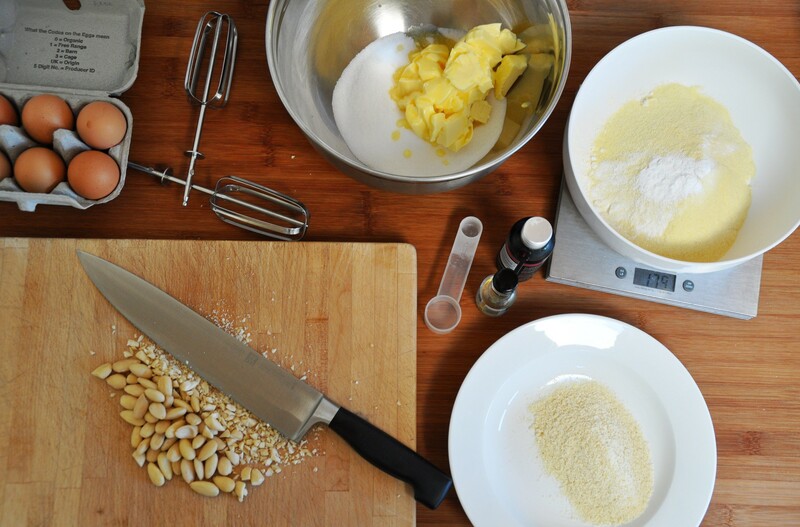 If using blanched almonds, chop them finely – either by hand or in a food processor. Alternatively use ground almonds – you won’t have quite such an interesting texture but it’s easier. I used a mix this time round – 40g ground almonds and 70g blanched almonds, chopped. 7. Sieve together the flour, semolina and baking powder. Add the chopped almonds/ground almonds. 7. 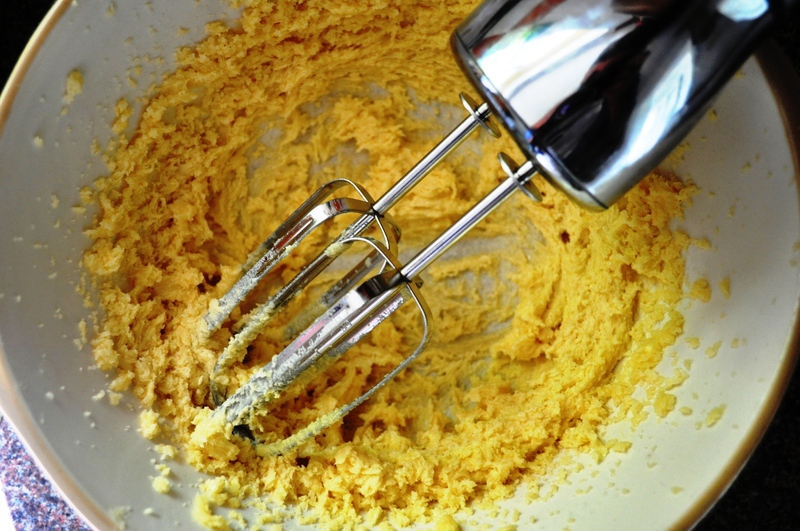 Add the flour mix to the creamed mix and blend well. 8. Preheat the oven to 180C. 9. Grease a rectangular tin, about 32x20cm. 10. 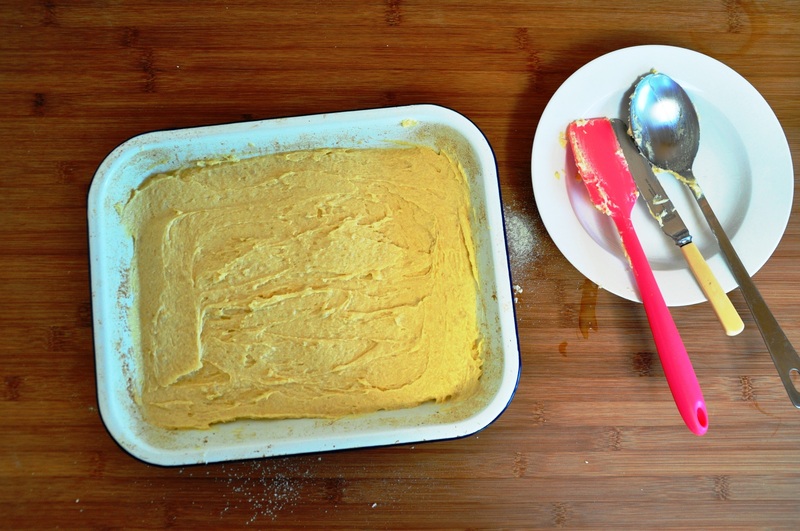 Spoon the batter into the tin, smooth it, and put in the oven for about 30-40 minutes, until firm and browned. 11. Remove from the oven and score a diamond pattern in the top with a sharp knife. 12. 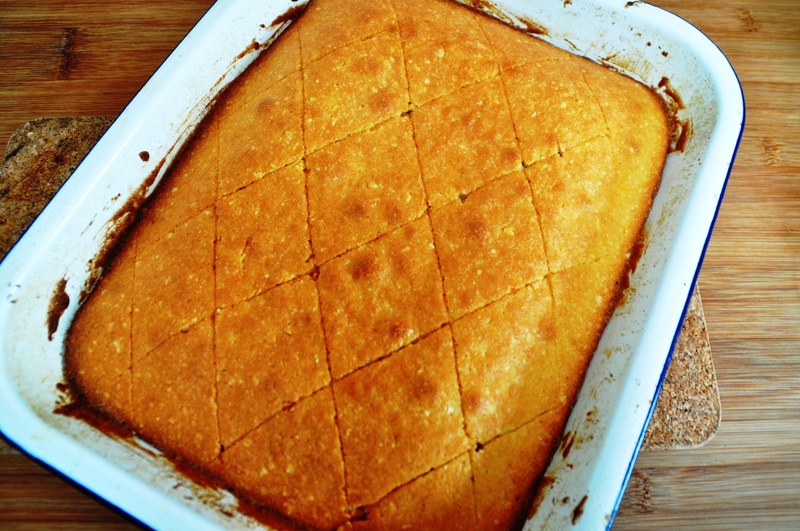 Pour the syrup onto the warm cake – through a sieve or strainer to catch the spices and zest. 13. Decorate the diamonds with a blanched almonds. 14. Allow to cool and serve at room temperature for tea or as a dessert. The latter can be souped up by being served with honey-sweetened Greek yogurt or poached fruit. When I thought I’d broken Fran’s camera last week, actually I’d just broken the lens thread. Phew. So we got a new (well, second-hand) lens. It’s an 18-200mm F/3.5-6.3, so Fran could use it more for landscapes and stuff. I’m not a photographer, and struggled enough to learn how to use the kit lens effectively, but now I’m struggling again. I can’t quite get in close enough, suspect I won’t be able to rely on the autofocus as much, and doubly suspect I probably could do with a faster 35mm or 50mm prime lens or something with a better macro. Gawd knows. It’s all changed so much since I got my photography O-level in 1986…. We’ve not had a kitchen for just over a week now. We’re having building work done on our house, and although the original plan was to only remove the kitchen half-way through the three-month schedule, on the first day the builder turned to me and said it’d be better if they did it straight away. Immediately. Post-haste. Subito. Or at least the day after. So I baked my final cake and final two loaves of bread, then set about removing the units. It was a hideous kitchen, and far from practical, but not having a kitchen at all is, to say the least, even less practical. Only so much baking I can do with a kettle and a microwave. Indeed, I never really use microwaves for anything other than softening butter for making cakes, so I don’t know what else you can do with them. Apparently you can “bake” in a microwave, but I can’t really imagine how. Not in a metal cake tin – unless I actively want to add exploded microwave to the chaos. Just before the demolition started, I was moving some shrubs from the area where we were building. One of these was a much-neglected gooseberry bush, which, despite being basically in the shade, had managed to produce a fair crop, just shy of a kilo. 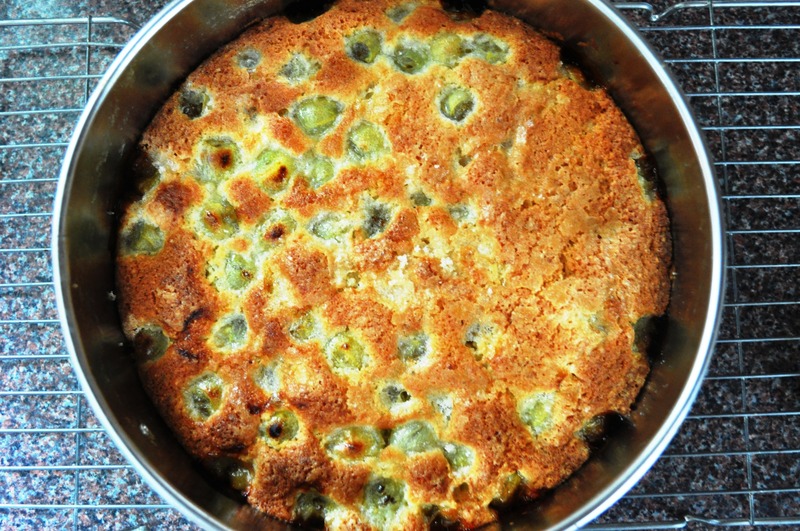 So that final cake had to involve gooseberries. Now, I can’t say I’m a huge fan of the “spiny grape”, as it’s called in Italian (uva spina). I used to eat them when I was a kid in the 1970s and early 1980s, but I have a feeling they’re slightly out of fashion these days. Despite how popular “retro” and “vintage” may be, I don’t hear people talking excitedly about gooseberry fools, an old-fashioned British summer recipe. Henry’s original recipe can be found here on the Torygraph site. I’ve tweaked it a bit. 2. Grease and base-line a 20cm spring-form cake tin. 3. 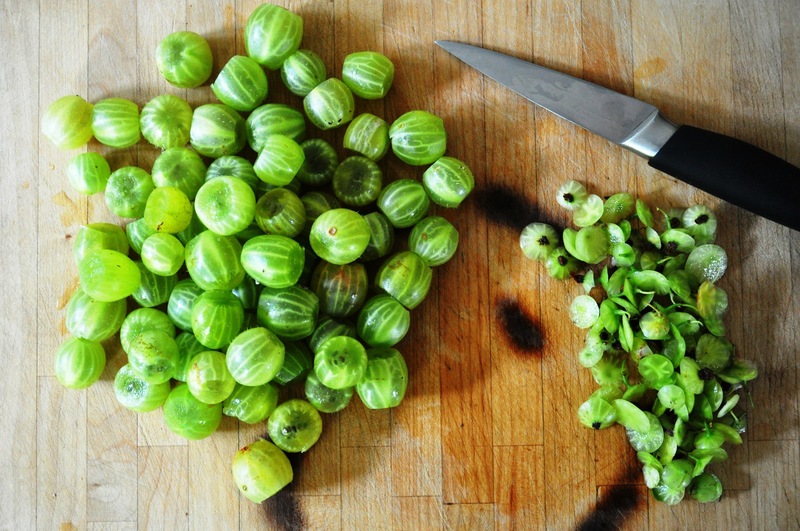 Top and tail the gooseberries then toss with 60g of caster sugar and leave them to macerate slightly. 4. Beat the butter and 120g caster sugar until pale and fluffy. 5. Add the egg a little at a time, beating well after each addition. If it curdles at all, add a little flour. 6. 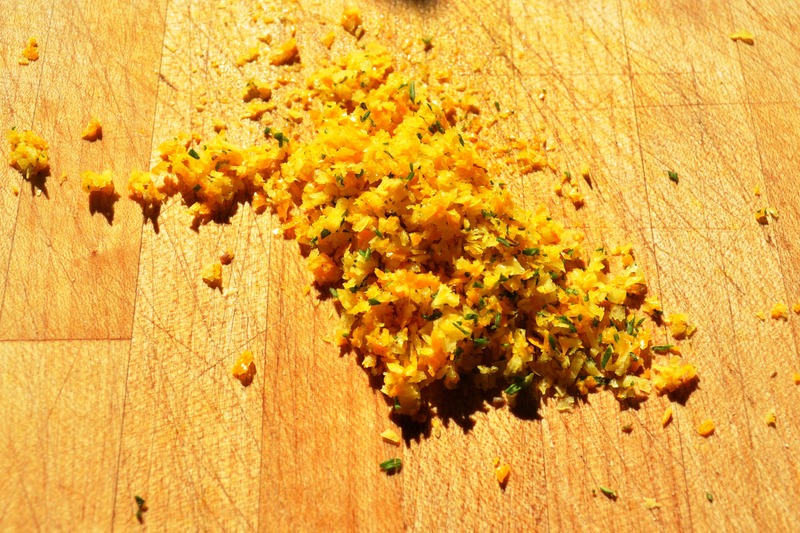 Finely grate the zest of the lemon. I also used some orange zest. Just cos. 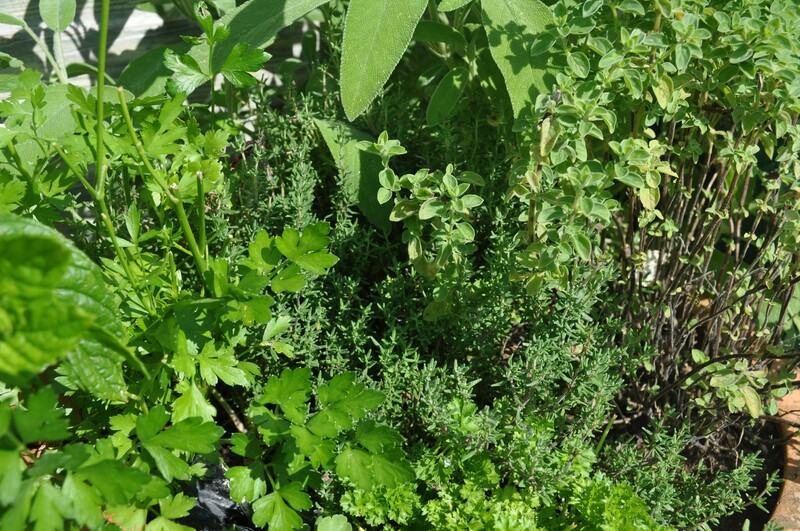 Finely chop the zests together with the thyme to free up all those lovely essential oils. 7. Add the zest and herbs to the batter and combine. 8. 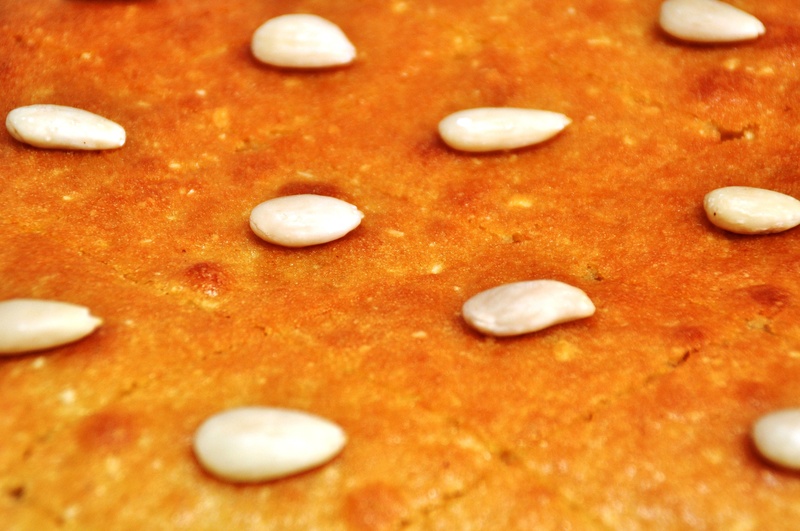 Sieve in the flour and baking powder, then fold to combine, along with the ground almonds. 9. Spoon, pour and scrape the mixture into the tin. 10. 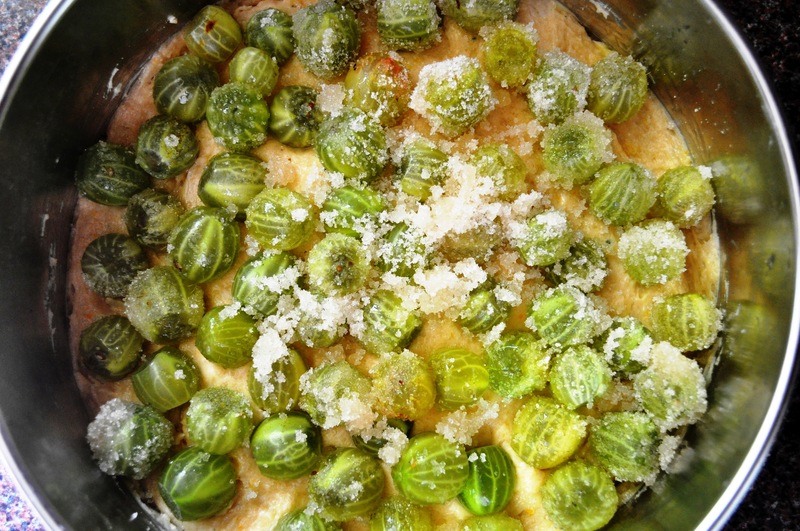 Spread the gooseberries over the top of the mixture. 11. Bake for 45 minutes and test with a skewer. 12. While the cake is still warm, make the syrup by dissolving the sugar in the lemon juice, with the thyme. 13. Pierce the cake with a skewer then pour over the syrup, removing the sprigs of thyme. 14. Leave to cool then serve. 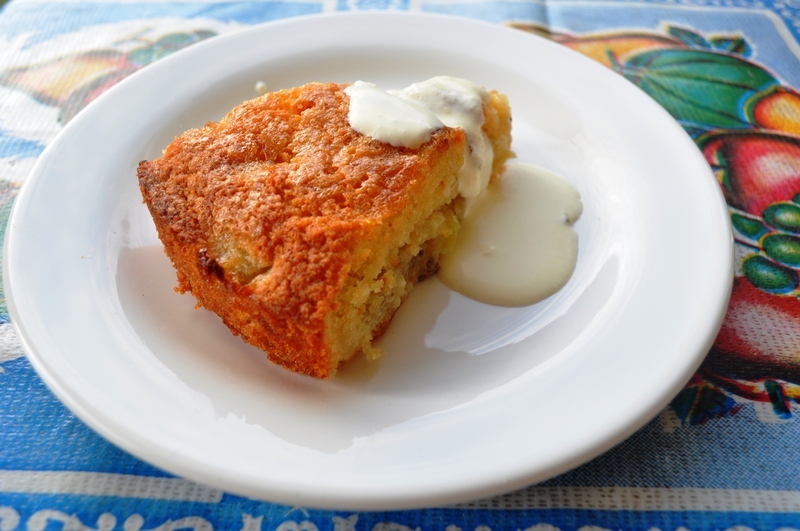 You can just with icing sugar, and serve with crème fraîche, cream or ice cream. Henry also has another one here, with flaked almonds. I think that could be nicer as the crunch of the almonds would contrast with the eyebally squish of the cooked fruit. Next year perhaps. Or perhaps Slater’s recipe, which involves a kind of crumble. Or perhaps I’ll just revisit the fool.